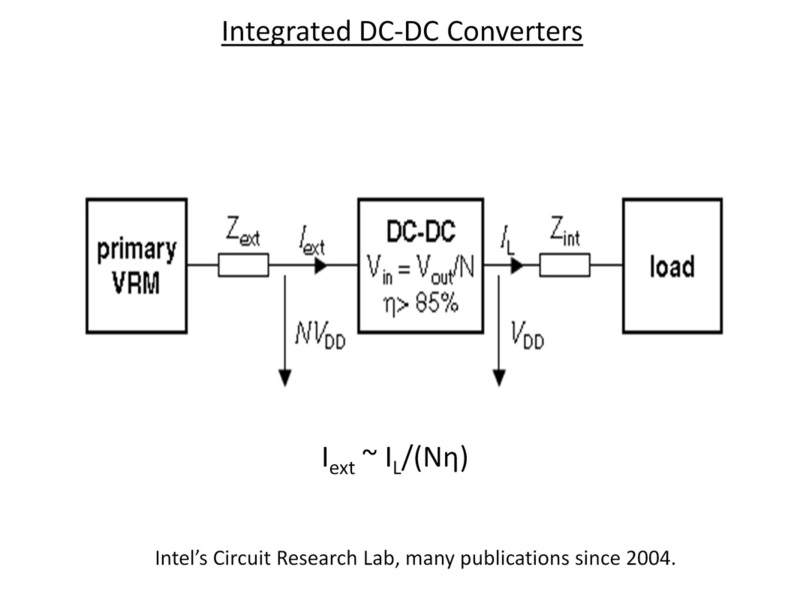 Throw cost at the problem: The simplest solution is to throw cost at the problem, and add additional resources, such as decoupling capacitance, vias, I/Os or routing area, to the power distribution network. Gang Huang from Georgia Tech explored these trade-offs with his 2007 EPEP paper... it was one of the first papers on 3D power delivery and has been referenced by quite a few people (link to paper). 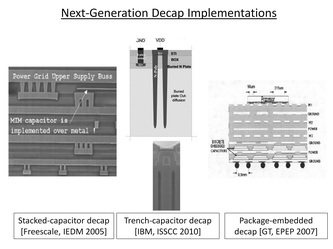 Next-generation decaps: Alternatives to gate-oxide decaps have been developed in the past few years, and are shown in the above figure. Freescale used stacked capacitor decaps in products and showed ~10% improvement in clock frequency. 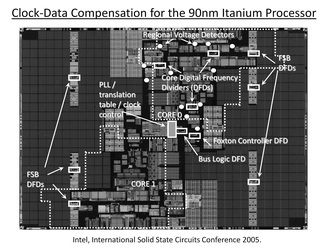 IBM has e-DRAM integrated with logic in their latest process technologies, and uses trench capacitors for decoupling. They claim 20x less area vs. standard gate-oxide decaps. The Georgia Tech Packaging Research Center has a program to embed decaps in packages too. 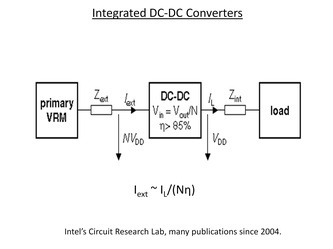 If package-level decaps were placed with low inductance between them and the chip, they were found to reduce the amount of on-chip decoupling required (link). 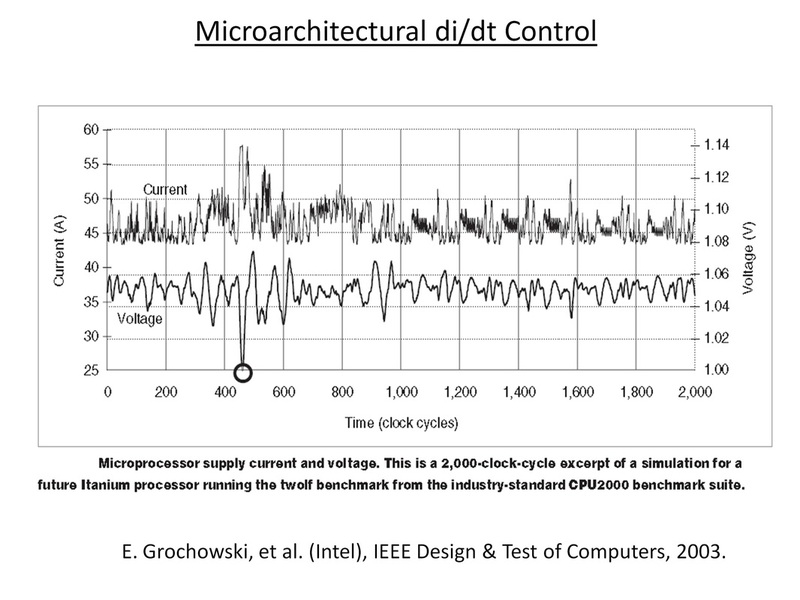 Microarchitectural di/dt control: Ed Grochowski and his colleagues at Intel wrote two good papers on this topic in 2002. 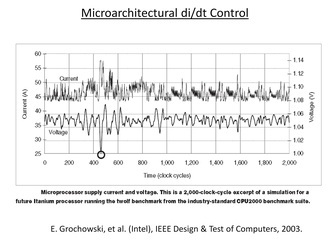 Please see the figure above, which shows the simulated chip voltage for some benchmark software. You'll notice that the worst case noise is encountered only for a short period of time. By using this "worst-case margin" for all cases, we increase supply voltage and power consumption significantly. Grochowski, et al. figured out ways of estimating supply voltage based on instructions being run by the processor, and turned off blocks when the supply voltage was going to droop too much. Note that a lot of the supply noise is at <100MHz, so it can be controlled using feedback circuits in a processor run at >3GHz. The authors estimated that the performance penalty of this scheme was small since the worst-case condition happened infrequently. 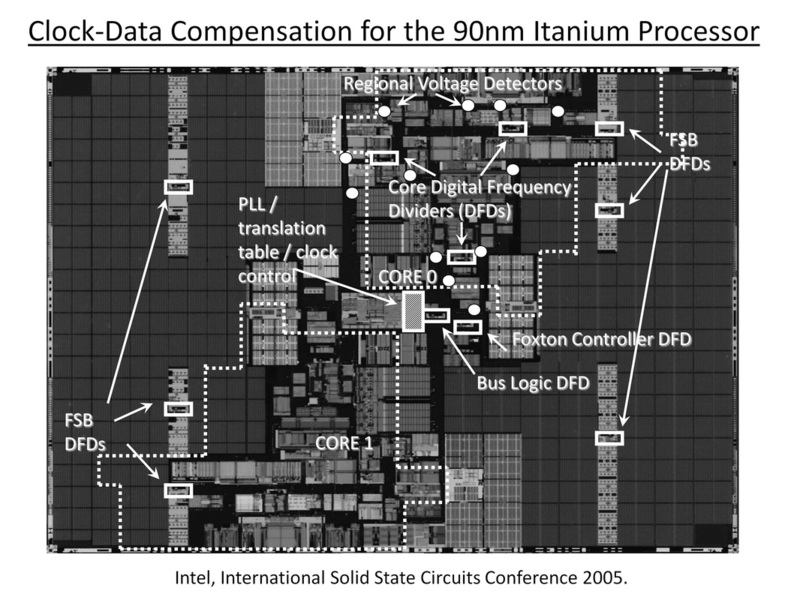 We've seen in this write-up that there are many ways of handling the power delivery issue for 3D-ICs. An architect could pick one or more of these techniques based on his or her trade-off analysis and risk profile. It looks like power delivery will not be a show-stopper to 3D-ICs, but will require good engineering, especially for chips that need >20W. Of course, the first logic-on-logic 3D-ICs will probably consume <1W and be used for smart-phones and tablets. It should be easier to handle the power delivery problem there.